The Bio-Up is a small-scale gas upgrading facility for use on farms. The tried and tested technology that is used in large-scale systems, such as at former dumpsites, has been scaled down to single farm level. Using Bio-Up, CCS has managed to create a system that is every bit as good as an industrial-scale installation in terms of technical standards, safety and gas quality. This technique means that livestock farmers can derive the maximum benefit from the manure that their animals produce. Until now, biogas was often used in combined heat and power installations (CHP). These installations convert biogas into electricity (35%) and heat (50%), with a loss rate of 15%. In many cases, however, the livestock farmers themselves actually only use the electricity generated. The Bio-Up ensures that the biogas is upgraded to biomethane, which is of the same grade as natural gas, meaning that livestock farmers can convert manure into energy at a rate of 100%. Any boiler, water heater and gas cooker in the Netherlands can use this gas from the grid. 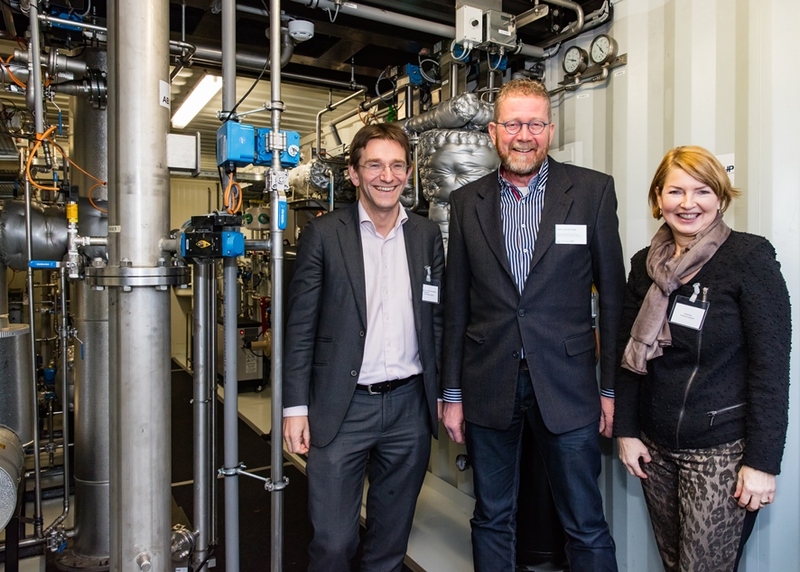 Using funding from TKI Gas, the Department for Dutch Entrepreneurship, LTO Noord, the Province of Overijssel and Climate-KIC, and working with many other partners, CCS has succeeded in applying robust and simple techniques in an innovative manner. For example, the gas can be supplied directly to the local low-pressure gas network using a simple domestic connection. As a result, operating costs and power consumption are kept to a minimum. Another priority was ease-of-use: the Bio-Up is fully automated so that the farmer does not need to worry about constantly regulating the system and remote technical support can be provided. The system will be delivered in a container, enabling flexible placement on the farm. CCS has developed two systems with different capacities: the units can supply up to 20 m³/h or 40 m³/h of biomethane. By standardizing these capacities, costs have been kept low and these volumes are suitable for the majority of dairy farms. Under current regulations in the Netherlands, it will be possible to recoup the required investment within seven years using these new biogas installations. Farmers can request a free scan to see which solution would suit them best. After a successful scan, CCS can provide assistance with applying for grants and permits. Nearly 150 people came to visit the De Marke trial farm to see how Bio-Up works for themselves. Farmers, researchers and policymakers were all full of praise. Several speakers, including visitors from Wageningen UR, LTO Overijssel and Climate-KIC, stressed the importance of smart manure treatment and energy production for both the agricultural sector and the environment. Society is demanding greater sustainability and the challenge for the sector is to respond to this in a way that enables people to continue to make a profit. The production of renewable energy by farmers is certainly a very interesting option. The development of Bio-Up is CCS’s response to these demands for sustainability: a small-scale gas production unit that can be installed on-site at farms. Fotobijschrift (van rechts naar links): Astrid Pap (provincie Overijssel), Zwier van der Vegte (Proefboerderij De Marke) en René Cornelissen (CCS) starten de levering van groen gas aan het gasnet. Er zijn indien gewenst meer foto’s beschikbaar. 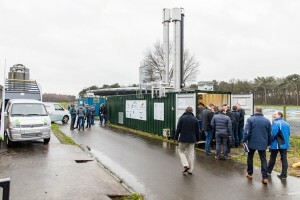 Voor meer informatie over de opwerking van biogas en de Bio-Up kunt u contact opnemen met Berry de Jong van van CCS Energie-advies. On April 1st the milk quota will be abolished. This may lead to greater numbers of cattle per farm and an increased production of manure and greenhouse gas emissions. Dairy farmers who would like to increase their milk production must find solutions to process an increased manure production. Such solutions could include an increased efficiency of nutrient use by using feed additives that increase milk production and reduce the emission of methane. Other examples are methane tractors powered by upgraded biogas produced from manure (Biogas-ETC project), or the improved recycling of nutrients on agricultural farms by using manure separators.Many more solutions are available on the market, yet often unknown to farmers or food industries supporting a nutrient-efficient and climate-friendly milk production. Many solutions can be supported by the financial and policy instruments in the new Common Agricultural Policy. CSA Booster is a new broker organization aiming to connect agricultural cooperatives and food industries to providers of technologies for these solutions. This article was published on www.csabooster.eu. Bertrand van Ee, CEO Climate-KIC, recently mentioned the BiogasETC project as an inspiring Dutch example of climate mitigation innovations in his interview with the Dutch Financial Times. Please find the full article (in Dutch) below. In December 2014, the installation was transported from Nijkerk, where its final assembly took place, to experimental farm ‘De Marke’ of Wageningen Livestock Research. After installation, cleaning and testing, the demo will start running by the end of January 2015. Raw biogas from the anaerobic digester will then be upgraded to biomethane, which will be injected into the natural gas grid, replacing fossil natural gas with renewable green gas. View photo album. BiogasETC nominated for the EIT Innovator Award 2015! Biogas ETC is now one of the two Climate KIC nominees for the 2015 EIT Innovators Award! Created in 2008, the EIT’s mission is to increase European sustainable growth and competitiveness, to reinforce the innovation capacity of the EU Member States and to create the entrepreneurs of tomorrow. In order to support this aim, the EIT organises annual awards to recognise and reward the successful start-ups, innovative projects and young entrepreneurial talent that Europe has to offer. Every year, each of the KICs (Knowledge and Innovation Communities; Climate-KIC, EIT ICT Labs and KIC InnoEnergy) selects two nominees for each award category. Biogas ETC now is one of the two Climate-KIC nominees for the 2015 Innovators Award. During the ‘InnovEIT 2015’ EIT Innovation Forum on 5-7 May in Budapest, a high-level jury will judge materials provided and the presentations given by the nominees. The overall EIT Innovators Award winner will receive an increased European-wide promotion and the use of the label “EIT Innovators Award Winner 2015” in their profiling and/or marketing activities, as well as a tailored package to support the further development of the project, product or service. Take a look at the photo impression of the location where our innovative biogas upgrading installation will be built and piloted, at WUR dairy research farm “de Marke”, Hengelo (NL). Wim Bijkerk, student of the VU University of Amsterdam, completed his BSc thesis within the BiogasETC project in July 2013. Dr. René Cornelissen of CCS has acted as Internship coach; 1st assessor was J.A. Neijzen; 2nd assessor was J.P. Dekker. Biogas can be obtained through the digestion of organic waste flows, which provides several advantages. The produced biogas is a sustainable source of energy and reduces the emission of greenhouse gasses, without ending up in the food vs. fuel dilemma. Additional benefits of biomethane, a biogas derived natural gas substitute, is that waste flows yield a valuable product, which can be integrated in the Dutch energy supply very well. Biomethane can play an essential part in the energy transition, because the biogas production is more predictable and controllable than the wind and solar energy production. Biogas production suits the agricultural sector very well, because agriculture, especially farming, produces large quantities of waste and contributes significantly to the emission of harmful greenhouse gasses. This combination creates opportunities to make the sector more sustainable, without emplacing restraints or limitations on everyday practice. The most suitable for small scale biogas production are farms with relatively large waste flows and a need for fertilizers on pastures. These conditions can be found best at Dutch dairy farms. The utilization of the produced biogas is an important factor in small scale biogas production. Nowadays nearly all biogas is used to produce heat and power in CHP-units. The low efficiencies and the lack of a sufficient nearby heat demand constrain the usability of this method. 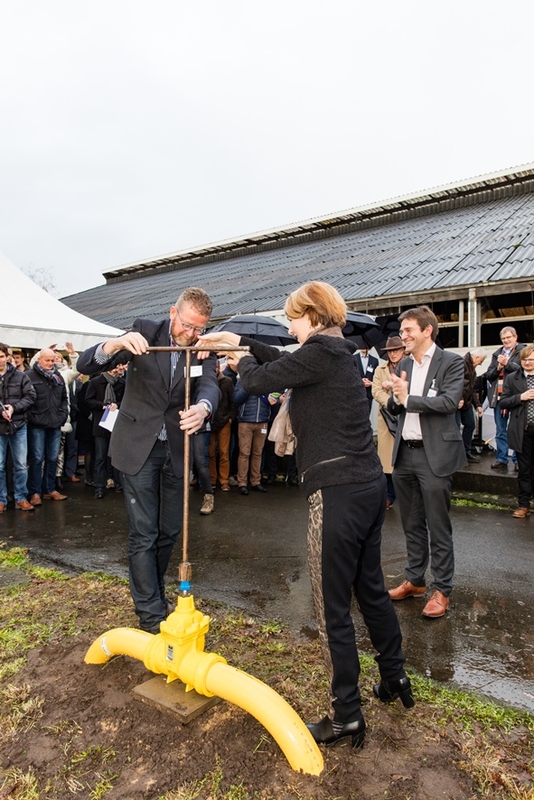 In order to overcome these two drawbacks, Cornelissen Consulting Services B.V. is developing a small scale gas upgrading plant to produce biomethane from biogas. Gas upgrading isn’t hindered by the large dissipation of usable energy. The developed installation uses an innovative scrubbing agent, which removes CO2 and H2S simultaneously from the biogas, whereby methane losses are zero. There are definitely opportunities for small scale biomethane production at farm sites. Biomethane production can be an additional source of revenue, directly though the sales of biomethane and, eventually, indirectly though the induced possibilities, e.g. waste processing. Regardless of any financial benefits, the production of biomethane yields large environmental benefits. One digester and upgrading plant at a dairy farm will reduce GHG-emissions with 346.3 tCO2e/year. Calculations based on the current tailored plant design and the development up to this point; indicate that small scale upgrading is not yet feasible. The overall design of the installation as well as the scrubbing agent have to be improved. Calculations based on batch production, better heat integration and a more stable scrubbing agent; a future vision indicates a sound and solid case is achievable. The estimated €400,000 investment has a payback time of 6.3 years and the NPV of the project is €64,000 at a 15% discount rate. This future vision can be achieved through focusing on two key aspects. The first aspect is the design of the plant. Enhancements have to be made to reduce energy and financial losses; key points of interests are the durability of the scrubbing agent, heat integration and a robust design. The second aspect is the valorization of the triggered non-financial benefits, like reduction of GHG’s and manure processing.